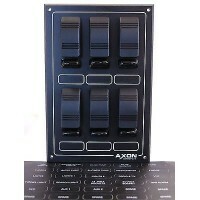 A water-resistant marine switch panel incorporating Carling V Series Contura switches. Fully w..
A switch panel incorporating Carling V Series Contura switches. Fully wired and supplied with self-a..
Modular designed water-resistant marine switch panel incorporating Carling V Series Contura switches..